As an indigenous girl, Chea Lach benefitted from multilingual education when she was at school which ensured she stayed in school and was eventually inspired to become a multilingual teacher herself. She now teaches using the multilingual curriculum at a primary school in the neighbouring village to where she grew up. The student is now the teacher. “I became a teacher because of the support of my parents. The reason why I teach multilingualism is because I think firstly, I am an indigenous person and the second is not to lose the traditions and cultures of indigenous people,” says Chea Lach. 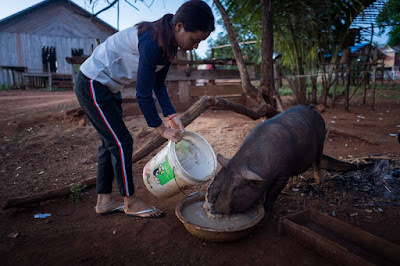 Chea Lach feeding the families' pigs before leaving for school. 22-year-old Chea Lach’s day begins early. She gets up just before daybreak and by the light of her torch prepares breakfast for the families’ pigs. As the light grows, so do the noises and activities of the village around her, as the community prepares for the day ahead. Quietly and diligently, Chea Lach goes about her daily routine, and by the time the village is bathed in the orange glow of morning light, she is ready to leave for her school. Chea Lach is one of two teachers at Kres Primary school in Poy Commune, Ochum district, Ratanakiri Province. The school sits at the edge of a forest opposite the main village of Kres, an indigenous community of around 64 households whose ethnic language is Krueng. A critical problem facing many children whose first language is an indigenous or ethnic minority language is that they often feel excluded from schools because they, and their parents, can’t understand the teacher. However, in Kres Primary School, the teachers have changed the lives of the children and their families, thanks to the introduction of the multilingual education curriculum in the school and their ability to teach it. Chea Lach during class at Kres Primary school in Poy Commune. 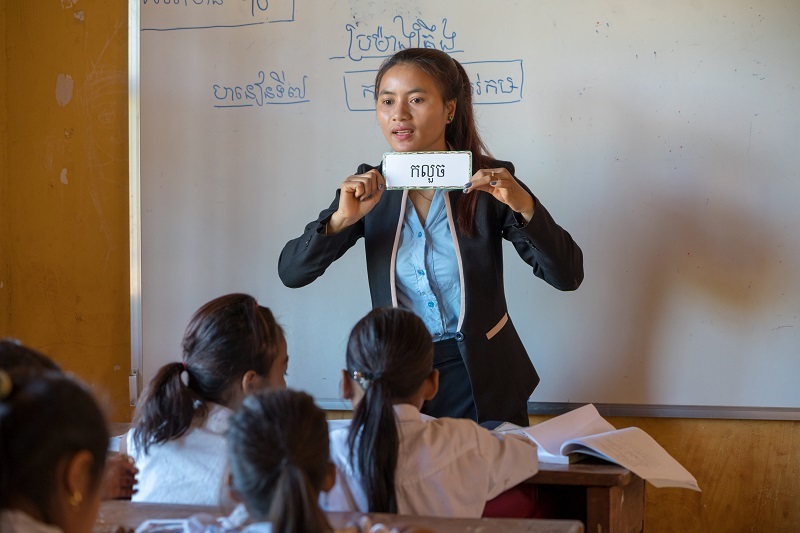 In 2014, the Cambodian Ministry of Education, Youth and Sport (MoEYS) developed, in collaboration with UNICEF, the first Multilingual Education National Action Plan (MENAP) which now supports thousands of indigenous children in rural communities throughout the country to stay in school. Education is provided in preschool and the first three years of primary school using a short “bridging” model in which the Indigenous language and Khmer are used in preschools and primary schools with a unique curriculum for MLE. By the time they reach grade four, the children will have transitioned to the national curriculum in Khmer. In collaboration with partners, Primark and SIDA, UNICEF is supporting the Multilingual Education National Action Plan implemented by the Royal Government of Cambodia. There are 38,327 indigenous people (around three per cent of the total population) from over 10 ethnic groups and the multilingual education programme is helping to overcome the multiple obstacles faced by ethnic minority children in accessing quality education. Chea Lach’s training in multilingual teaching enables her to ensure indigenous children access a quality education which is meaningful to them, increasing their confidence and keeping them in school, leading on to academic success. As a student who benefitted from multilingual education, Chea Lach knows how important it is for schools to offer a curriculum which is relevant to their indigenous culture, to make school a safe and reassuring place where they can understand the lessons and make sure they stay in school, all the way through to graduation. Chea Lach is making a huge impact on the lives of indigenous children, giving them a chance to stay in school and receive a quality education.